No, not the words you're thinking about.... but three little words that expressed the biggest single tribute to one of the most honored men in history. I'll tell you those words a few lines down. There's much talk about terror these days, but I well remember another time.... summertime in the 1950's.... when fear gripped parents all across America. We kids were warned to stay away from large gatherings, even from eating certain foods, during the hot months. It wasn't terrorists we were afraid of..... it was polio. The disease had always been around, but in 1952, it struck almost 60,000 Americans, robbing many of the use of their limbs or lungs. Thousands died. We were all painfully aware of polio. In movie theaters, before every movie, they'd show images of paralyzed kids being kept alive by iron lungs, or crippled by the disease. Then, they'd stop the show, bring up the lights and make appeals for the March of Dimes, to fight polio. I remember my parents not allowing me to go to public pools in the heat of summer because of the fear of contracting polio. I also clearly recall in the Spring of 1955, just as those summertime fears were stirring, our school principal announced on the classroom speakers some news he had just heard. A vaccine had been proven safe and effective in the fight against polio. We were just kids, but we cheered. After years of research and human trials, the work of Dr. Jonas Salk had paid off. His vaccine was found to effectively protect people from the polio virus. 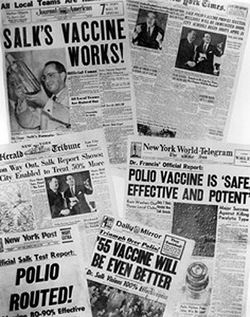 Dr. Salk was suddenly world famous. People considered him a miracle worker. And then he did something amazing. He refused to patent the vaccine. He said he didn't want to profit from the vaccine.... he just wanted as many people as possible vaccinated. Can you imagine such a thing today? Dr. Salk received every humanitarian, scientific and medical award you can imagine. He had scholarships and buildings dedicated in his name all over the world. But, what Dr. Salk called his greatest honor came a few years later. A father introduced his young son to Dr. Salk, saying "This is Dr. Jonas Salk, the man who developed the vaccine for polio". Jonas Salk would have turned 90 years old today.